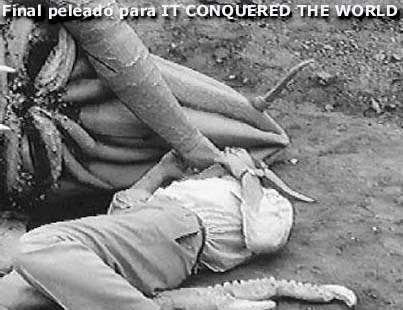 It Conquered the World concerns an embittered human scientist who guides an alien creature called Zontar from Venus to the Earth, so that it can bring peace to our troubled world by ridding humankind of its feelings and emotions. The scientist, however, is totally oblivious to the terrible consequences of his actions. The alien creature from the planet Venus secretly wants to take control of the Earth by enslaving humanity using mind control devices and as part of its nefarious plan, it makes radio contact with the disillusioned scientist who agrees to help. Our well-meaning but naïve scientist believes this alien intervention will bring peace to the world and save humanity from itself and its inevitable demise. Corman: Well, we begin the film with credits rolling, along with a strident music score by Ronald Stein and a horizontal white line of the type that you see across monitor screens. This seamlessly transitions to a screen in a satellite launch and monitoring control room. Do we now have your attention? Lee Van Cleef: Meanwhile in Washington, D.C., Secretary Platt played by Marshall Bradford is meeting with my character, Dr Tom Anderson. From my point of view as Anderson, I’m there to plead with Platt to cancel the satellite project. I was not all that surprised when told that the first satellite launched had exploded in orbit. I knew that "It was a warning” which I had already anticipated three years before the launch. I firmly believe that "alien intelligence watches us constantly." Imagine how I felt when I was told the satellite had already been launched! 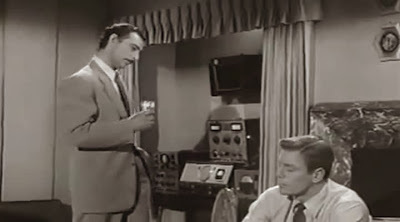 Peter Graves: My character, Paul Nelson and his wife Joan are later having dinner at the Andersons’ home, As we finish dinner, I state that the satellite has been in orbit for three months and all is well. Joan gets a bit annoyed with all the shop talk, but Tom’s wife, Claire played by Beverly Garland is more concerned about Tom and his delusions. Tom draws me over to his radio, tunes in a station and informs me that the sound he is now hearing is the planet Venus. He then asks me to “listen to it…..Listen to the voice.” What can be heard appears to be nothing but humming and static. What would you think if you were in my place? My wife and I quickly leave the Anderson’s and drive to the nearby installation where I’m told by Pete Shelton that "its back". I confidently state we’ll bring the satellite down for a full examination. Lou Rusoff: We continued the story with the team bringing the satellite back the next day, but not without a hitch! Instead of the satellite returning to the designated landing area, it crash lands ten miles south of the Anderson home, in the vicinity of a cave and hot springs. The location’s importance becomes apparent later on in the story. Beverly Garland: Out of the blue Tom tells me, "he's alive, he survived the crash!" What else could I say at this point but, "Tom, you’re a sick man." All that my character Claire could think to do was go into town and hope that Tom would be better when she returns. Corman: OK, so the Venusian creature that we see exiting the satellite looks like a cross between a giant pickle and some kind of deformed crustacean! I didn’t have a million bucks like Conquest Of Space, This island Earth or Forbidden Planet to make this film you know. Still, if Klaatu from The Day The Earth Stood Still could do it, Paul Blaisdell's alien pickle could also cause electricity all over the world to fail! And it wouldn’t cost us an extra buck! Anyway, I firmly believe that my alien depiction will seem quite conservative when the time comes for us to make contact with alien species who will no doubt come in an infinite diversity of forms. 3:03 p.m. being the time when all the clocks stopped. Eight people on a list who are destined for mind control devices. Panic erupting among the people in town. No communication with the outside world as the wire service has broken down. Anderson possessing the only working vehicle and water supply despite the fact that that electricity, combustion engines and regular water supply have been disabled. 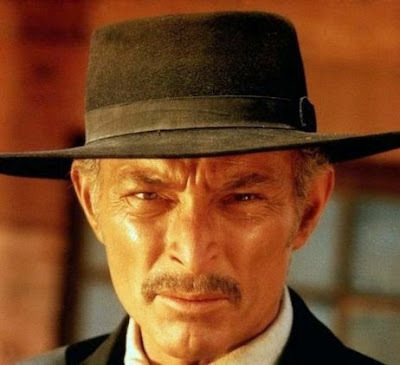 Lee Van Cleef: You know, after watching this film, some people have told me that I’ve got the kind of stare that can flail the skin off people and pierce their souls. Hhmm. Might prove to be useful in future roles? I’m thinking...westerns perhaps? After all, how often have we seen instances of people convincing themselves of the truth of something, no matter how delusional, which then can often assume its own sense of logic and becomes a part of their own world view? Any argument or facts to the contrary are dismissed out of hand, even as something as reasonable as Paul’s statement; “I’d have to take a look at anything that would change the world and me so completely.” Good advice for any generation…. 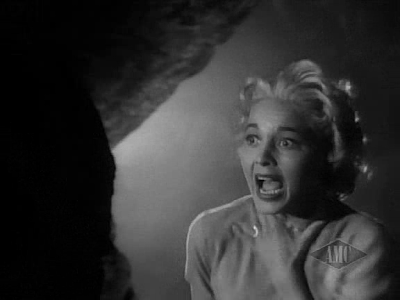 Corman: You guys know me and how I like to keep the action in my films rolling and carry the audience along with it. Well, these days the audience is pretty darn fearful of possible invasions from foreign powers and Communist conspiracy threats and such. This will always be the case. If it’s not fear of Communists like we have today, it’ll be of something else in the future. Fear and playing on that fear is such a powerful motivating and manipulative force. So, in the film back at the installation we have General Pattick informing the technicians that, "We’re in the midst of a Communist Uprising” and that “they've sabotaged every power source in the area." He then orders the staff to remain at the installation while the city of Beachwood is evacuated. The Sheriff tells Nelson he is going to place him under “protective custody,” when he confronts the sheriff over the shooting of Haskell. After a physical struggle with Nelson, the sheriff, under orders from the Venusian, tells Nelson, "you're to be one of us...Get up, you're free." I guarantee that even 60 years from now you’ll see similar elements to what I have just described being played out but in a different context and set of circumstances. Peter Graves: My character, Nelson arrives to find the installation closed. I find General Pattick there and he informs me that the staff was relocated (another euphemism Lou?) to a nearby air base and that I, along with my wife, should join them. As the general offers me a ride in the jeep, I begin to feel that something is wrong. I feel compelled to act so I hit the general on the back of the neck with my gun, throw him out and take over the jeep. 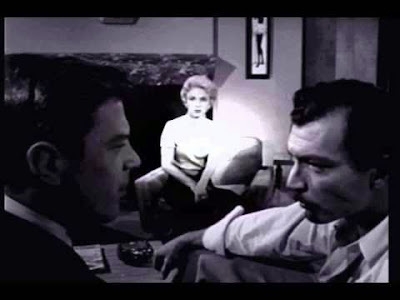 Lee Van Cleef: Nelson drives up to my house where he confronts me and accuses me of being a murderer. I confess to Nelson about my role and try to convince him about the positive aspects of the alien’s ultimate plan for humanity. Before he left, Nelson merely called me a traitor who is not just “betraying part of mankind” but is “betraying all of it.” He’s an intelligent man. Then why can’t he see the benefit to humanity that will result from assisting the Venusian? According to Claire I just “had an undeserved stay of execution" as Nelson had a gun on me! If I knew that I would have stared him to death! Ha! Ha! Corman: Killer stares? Don’t be silly Lee. Flying bat control devices! Now, that’s something! Fits in beautifully with the action and drama about to be unleashed as Nelson arrives late to his house after having to use a bike when his jeep stopped running. Not realizing that the lights are on, both outside and inside the house, he is greeted by his wife. Joan is behaving strangely (even for a wife) and is concealing a control device which she throws at her husband. She then calmly takes off for a walk leaving Nelson to go a few rounds with the control device. It rapidly degenerates into a no disqualification match with Nelson impaling and killing the aerial varmint. Sally Fraser: Ever heard the term, “Better off dead than Red?” Well, that’s given new meaning when my character Joan Nelson returns from her walk expecting her husband to be like her: controlled for the rest of their lives. As soon as I tell him that will in fact be the case, he shoots and kills me! Corman: Now think for a moment about what it must take for a husband or wife to take the life of their spouse in the belief that they are saving them from something far worse than death itself! A scenario almost too horrible for an audience to contemplate…. 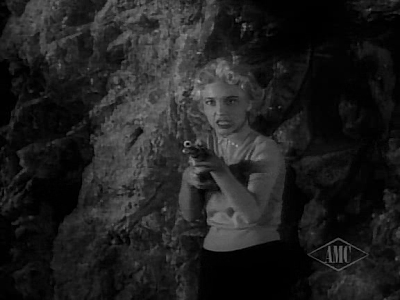 Beverly Garland: It transpires that my character’s husband has been directed by the alien to kill Nelson as he “knows what he is fighting for and must be killed.” I feel I must find out as much as I can about the Venusian and try to prevent Tom from carrying out the alien’s orders. I manage to find out that the Venusian is located at Elephant Hot Spring cave because he needs a climate similar to his home planet, Venus. I also discover that Joan has been controlled. Karen Kadler: What Claire doesn’t know is that back at the installation, two of the control devices were used on Pete and Floyd. My character, Ellen wakes up and notices that the power is back up and all the equipment is functioning. While going to make coffee I notice two dead control devices. Suddenly, Floyd gabs my neck with both of his hands and that’s the end of me. I tell you it was mighty cold lying on that floor considering how little I was wearing! I guess there was a reason for that......? Beverly Garland: Now, we come to a part of film that I’ll remember for a long time to come. I really wanted to throw as much feeling, emotion and drama into my role as the script and story would allow. After my husband refuses to listen to my appeals, he leaves the house to meet Nelson outside. In a rage I contact the alien on the radio and threaten to kill it. I take the rifle that Tom left on top of the radio and leave the house. I then steal Joan's station wagon and take off to confront the Venusian at the cave. Peter Graves: Meanwhile, my character, Nelson informs Anderson that Joan is dead. I tell him I felt that “she wasn't my wife; She was a product of (Anderson’s) work." I then empty the rifle’s magazine into the creature but with no effect. At least I meet death standing and defiant instead of living obediently in servitude on my knees. Peter Graves: Yes, both Nelson and Anderson hear it on the radio back at your house. It seems to trigger something in Anderson who decides that he will help by going to the cave and kill the creature. The comical Pvt Ortiz, who while looking for food, hears Claire's screams, enters the cave and fires at the creature. He manages to escape and returns to his unit to report on what has happened. Nelson discovers Ellen's body at the installation, enters an office and shoots Pete, Floyd and General Pattick who is only wounded. Anderson, meanwhile comes across the Sheriff blocking the road leading to the cave. The Sheriff fires at Anderson, but Anderson circles around on foot and barbecues him with a portable blow torch. The wounded Gen. Pattick heads for the cave in a jeep but is ambushed by Nelson who is now on foot. Nelson manages to shoot and kill the general. While Nelson drives to the cave, the army boys have entered the cave and open fire on the Venusian, but this just makes it grumpier and draws it outside. A bazooka is then employed but this just puts the alien in a really foul mood. A touch of redemption along with payment for past sins is always a good touch to add. And so we have Anderson on the scene ordering a cease fire. He decides to flame grill the Venusian with his blow torch (and death stare) but it attacks and kills him before it too dies. We finally end with Dr. Paul Nelson's closing observation about Dr. Tom Anderson and others like him who……. "Man is a feeling creature, and because of it the greatest in the universe. He learned too late for himself that men have to find their own way, to make their own mistakes. There can't be any gift of perfection from outside ourselves. When men seek such perfection they find only death, fire, loss, disillusionment and the end of everything that's gone forward. Men have always sought an end to our misery but it can't be given, it has to be achieved. There is hope, but it has to come from inside, from Man himself." 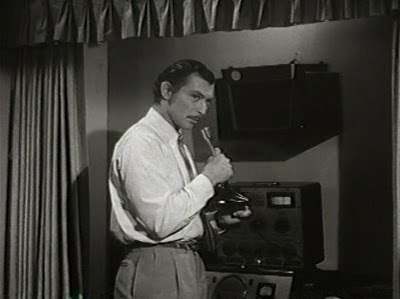 Lee Van Cleef: Hey Roger! You got any westerns in the pipeline? 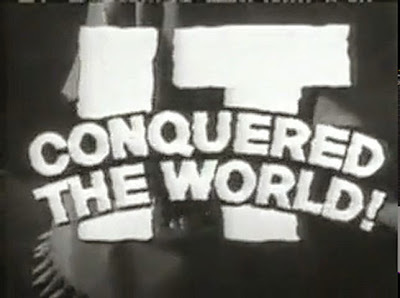 There’s no escaping the fact that It Conquered The World was a low budget movie with special effects to match that will cause audiences to chuckle. This is more than made up for by the film’s energy and its surprisingly above- average cast. 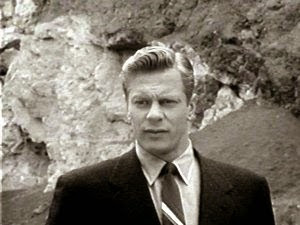 Peter Graves will always be remembered as Mr. Phelps from the TV series, 'Mission: Impossible.' In It Conquered The World, Robert Graves gives a solid performance as the scientist who maintains his integrity despite his friendship with his friend and fellow scientist turning sour due to the latter’s misguided betrayal of the human race. Van Cleef we know from his work in movies such as 'The Good, The Bad And The Ugly' and 'Death Rides A Horse'. 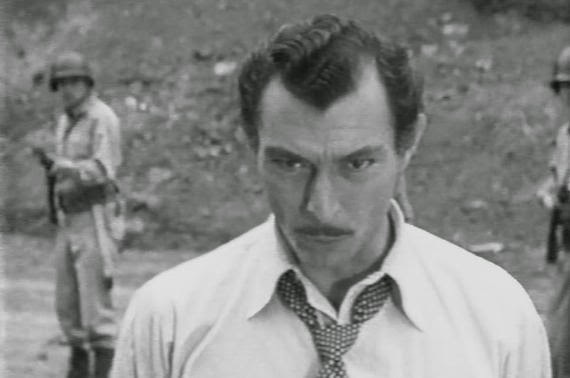 In It Conquered The World, Van Cleef gives a strong performance as an obsessed, disillusioned and bitter scientist who is intent on selling his soul to an alien devil. 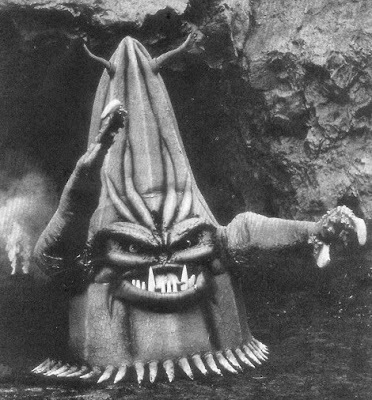 In 1966 there was a why-bother remake by Larry Buchanan called "Zontar the Thing from Venus." Despite its shortcomings, the film works on many levels including interesting characters and the moral choices they make, complex and thoughtful plot, playing on ‘50s Cold War fears, and so on. If there was a Royal Society for the Prevention of Cruelty to Aliens, Zontar would receive its protection considering how many times he was shot, bazookad and blow-torched! Zontar was seen as being an animal who was being subjected to extreme violence. This was why the movie was originally given an 'X' rating in England, and nearly banned. The movie's director argued that the alien was not in fact an animal, but was instead an intelligent being. On this basis the ban was removed. 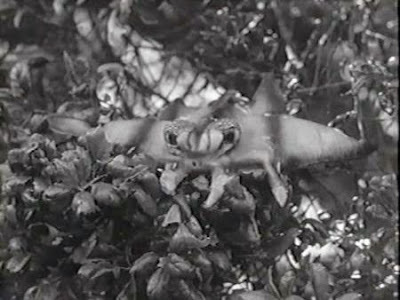 Roger Corman came up with the idea for the design of the creature believing that since Zontar came from a big planet, it would have evolved to cope with heavier gravity than Earth's gravity and would appear to be somewhat squat in stature. 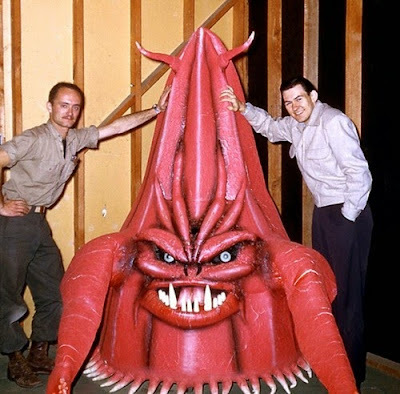 Paul Blaisdell who built the creature thought that the camera would make it look bigger. 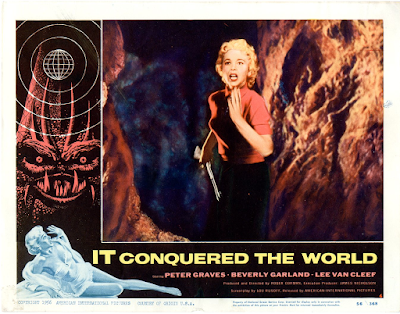 Just how frightening it was can be judged from Beverly Garland’s reaction when she first saw the creature: "THAT conquered the world?" together with her kicking 'It' over…….